Last week, I reviewed TimeStream Software’s app Walt Disney World Notescast Guide 3.0. This week, I’m moving on to their recently updated app revealing some 250 of the Secrets of Walt Disney World, and another 200 fun facts! This Notescast is laid out in much the same format as the previous one. Tapping on a section will take you to the next screen, which often has more choices for you to select from. As a result, navigating through the vast amounts of data is really quite easy! One thing that I should point out is that the folks at TimeStream went to great lengths to ensure that a lot of the secrets that you would like to know about were included. However, as they told me when we were talking about the app, the one thing that they didn’t want to do was to reveal a secret that would remove some of the “Disney Magic” from Walt Disney World. As a result, not all of the secrets that Disney has have been revealed! As a parent of a nine year old, this is something that I really appreciate. As always, the photography in the Notescast is top notch, and some of the secrets that they reveal to us, the Readers, are how to get some of those same great shots ourselves! For example, take a look at some of these great pictures. For the first picture, pay particular interest in the perspective of where the picture was taken from! One thing that is really neat with the Notescast series, both with the Secrets app and the Guide app, is that as TimeStream updates the app, I get notified with the update through the App Store on my Touch. That’s great because it means that I always have the most current information at my disposal. Additionally, like the Guide app from last week, this app doesn’t rely on network connectivity at all. This is particularly important at WDW, where my iPod Touch won’t find a Wi-Fi connection. However, there is one thing that I would change. When you are exploring the different secrets, they are laid out by park and then by land, so as an example, when you are looking at the Magic Kingdom, there are several sections for the various lands. For example, there is one on Main Street, U.S.A. After you finish looking at Main Street, U.S.A., the guide directs you to continue your tour with the Adventureland secrets. You have to tap the “Back” button, then tap on the next section. I would have liked to have a link, much like the Walt Disney World Guide, that would take me straight to the next section. This app is priced at $2.99, which is a fair price for all the information you get. While I appreciate the Guide app more because of all of the planning I do for our trips, my wife appreciates the Secrets app more because she is into those sorts of secrets. So for those that aren’t sure which app to get, get them both! 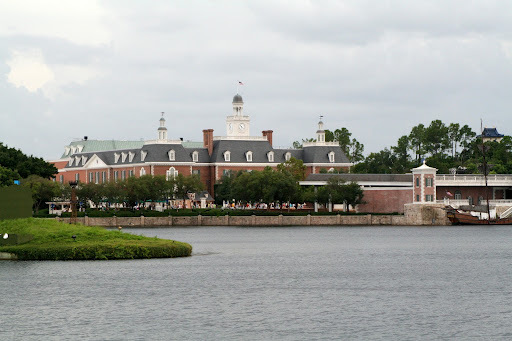 In my next installment of the countries of the World Showcase, I take you to one of my favorite countries on the circuit: The American Adventure pavilion. 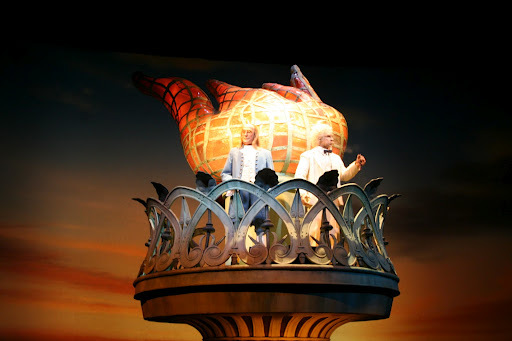 There is so much to see and do in the American Adventure, from listening to the Voices of Liberty, to watching the Spirit of America Fife & Drum Corps as you eat lunch, to seeing the incredible American Adventure show, a 30 minute show with 35 Audio-Animatronic characters about the history of America. There is such an incredible assortment of things you can do, that it is almost better that I show you some of the memories we have forged with our pictures. Before I leave you with those memories, though, the one thing that we have never done at the American Adventure is to enjoy a performance at the America Gardens Theatre. That is one of the things that I would like to do one year when it fits into our schedule. So now, please enjoy the pictures!